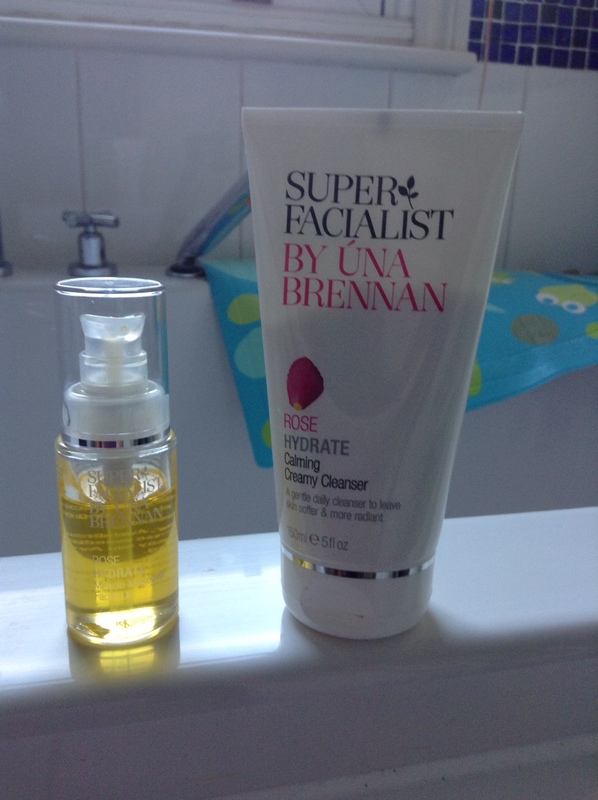 Yes I know I’m a bit late to this particular party…Una Brennan‘s range for Boots has been around for a good old while now. My only excuse is that I’ve been more than happy to slavishly follow a combination Laura Mercier/Liz Earle cleansing regime for a quite a while now (more of which on previous blog posts). So what tempted me away? Well, if you are a regular reader of my blog you’ll know that I’m a bit if a sucker for anything with a rose fragrance, plus any mention of a facial oil with a rose base to it, and it’s pretty much a given that I had to try it for myself. Added to this, it’s available in all Boots stores nationwide, so if I run out it’s pretty easy to re-stock. I tried the ‘Calming Creamy Cleanser‘ from this range as soon as my old LM favourite fan out. I found this to be a very calming, and creamy cleanser that is best applied to slightly damp skin, and then washed off. Personally I use it as a morning cleanser, as by itself it wouldn’t be enough to remove make-up. Which leads me nicely onto why I decided to use it along the ‘Miracle Makeover Facial Oil’, also from the Rose Hydrate range. The first thing to note about this oil is that this is not a moisturiser replacement, but is in fact a cleansing oil, to be used as part of a two-step cleansing routine. Yes, I know it’s a faff, who’s got the time for that, when handy little facial wipes exist to do the job in one go. Well, take it from me, this really is worth it. The deal is that you massage in this facial oil on your made-up face at night. It feels amazingly indulgent and relaxing and is definitely the favourite part of my night time routine now. You then use a muslin to wash it off with warm water. This is then followed by using the Creamy Cleanser to remove the last remnants of any make-up. By the time you’ve finished this routine, only a small amount of moisturiser or facial oil (I’m still using my LE stuff at this stage) is needed. Before I go, I’ll just quick mention that I’m currently trying Clarins’ Blue Orchid Face Treatment Oil, which I’m in a sample size of.